Olive oil and chocolate are a wonderful combination. Make this chocolate olive oil glaze for fruit, pretzels, cookies, or whatever you'd like to add chocolate goodness flavor to. Line a sheet pan with a piece of plastic wrap, parchment or a Silpat baking mat. Melt half of the chocolate with olive oil in a heatproof bowl set over a pan of simmering water (make sure the water does not touch the bottom of the bowl), stirring a few times until the chocolate is just melted. Add the rest of the chocolate and stir until melted. Remove bowl from the saucepan. Wipe the water from the bottom of the bowl. Crush the salt between your fingers and add to chocolate, stirring until the chocolate is completely melted and the glaze is smooth. To dip larger items: hold by the end or stem. Dip each piece two-thirds of the way into the chocolate. Lift up and allow the excess chocolate to drip back into the bowl. Set each piece on the lined sheet pan and push forward just slightly, so the chocolate doesn’t puddle too much. (Don’t worry if it does.) Allow chocolate to set at room temperature for about 15 minutes, then refrigerate on the tray until set. To dip smaller pieces, such as nuts or seeds, plunk a bunch at a time into a shallower bowl of chocolate and push them around with a fork until coated. 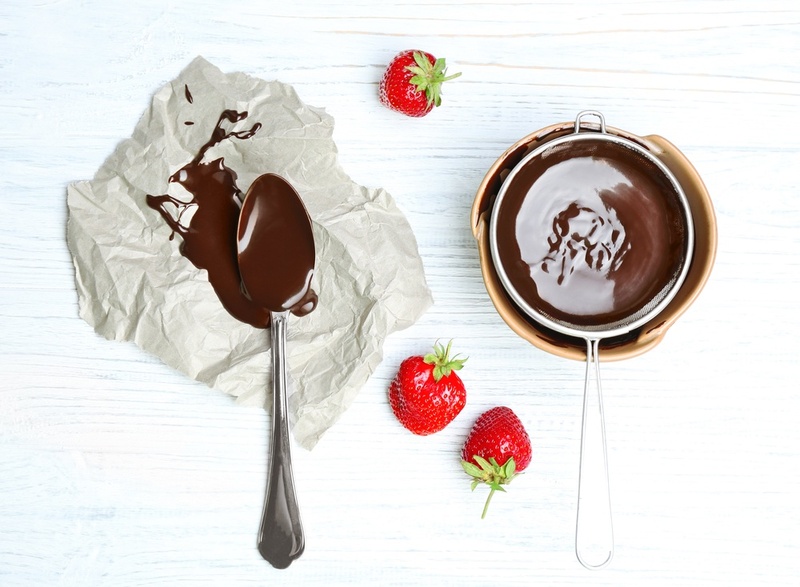 Remove with a large fork or slotted spoon and allow the excess chocolate to drip back into the bowl. Place on the lined baking sheet to harden and then refrigerate. Refrigerate until serving. The chocolate dipped “anythings” will peel off the acetate, parchment, or Silpat when the chocolate has hardened.